Holographic Images float in mid air. In todays competitive trade show environment exhibitors are often competing to draw attention to their trade show booth. A 3D hologram projector is a sure way to stand out from the other booths. This recent exhibit from Trade Show Holograms features a large, 5 ft wide holographic projection with full animation and sound. No special 3D glasses are required to see this amazing effect. The display also features 3 front monitors to show additional video or photo slide shows. These displays as well as a variety of other designs are available for both sale and rental across the USA and Canada. Large scale 3D Hologram Projector for trade shows. 3d Hologram Projector features Interactive touch screen, displays products at Adipec trade show in Abu Dhabi. 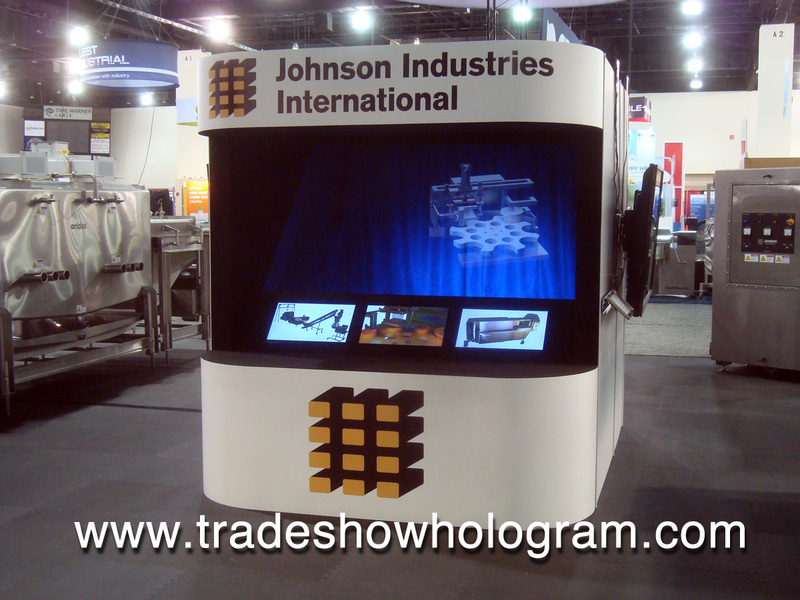 HD Hologram Projector features full 1080 HD quality Large Holographic projection at trade show booth.